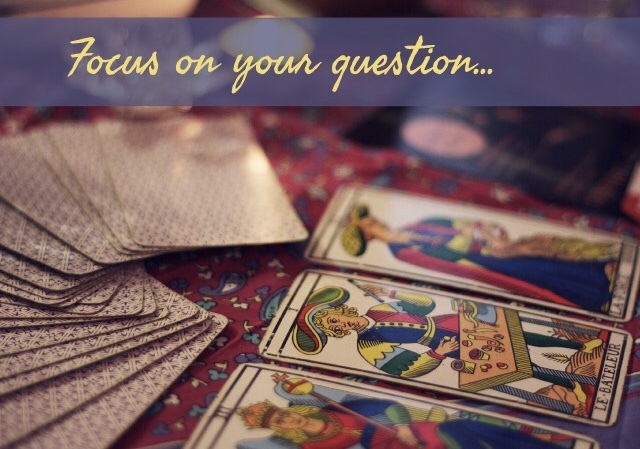 Last week I was at a Halloween party where a tarot card reader was telling fortunes. I love fortune tellers. I love to geek out over their predictions and try to suss out how much is coming from some cosmic source and how much they’re just reading me. So of course I was the first one to sit down. She told me to shuffle the cards while thinking of my question and the one that came to mind was: how do I build my writing career? Well, she wasn’t the greatest card reader. She asked me to tell her my question, so I did, and the rest kind of felt like a therapy session. But there was one thing she said that stuck with me. She told me that if I didn’t know what my goals were, I would never reach them. Um, duh. This is not rocket science. This is not even fortune telling. This is just plain common sense. But I had to admit, I don’t have any goals in place right now. 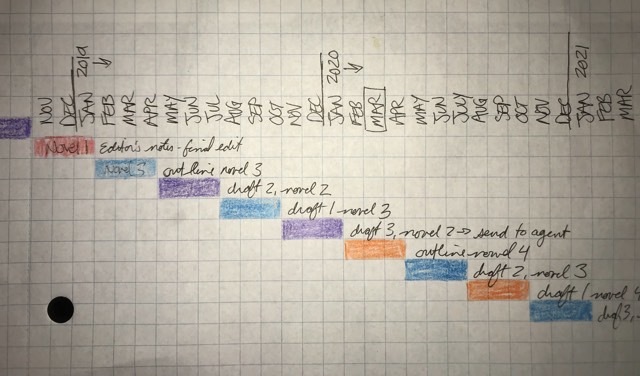 The thing is, I’m usually ALL ABOUT planning. I mean, if you follow along at all you’ve seen my bullet journal posts. You know I’m a total nerd for making plans and executing. 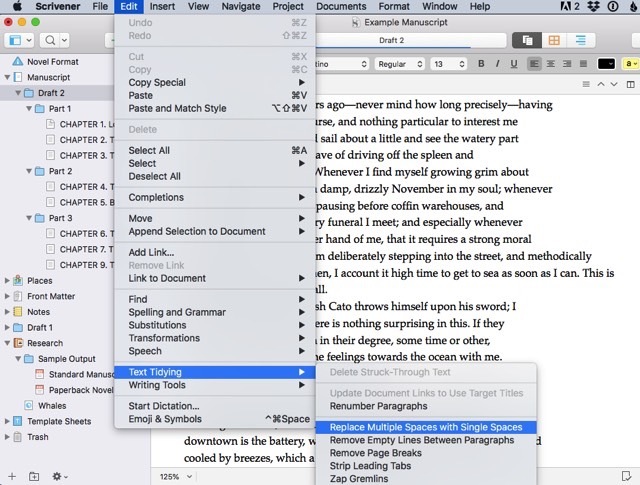 But here’s what I realized: for the longest time my goal was simply to finish my novel and get it out into the world. 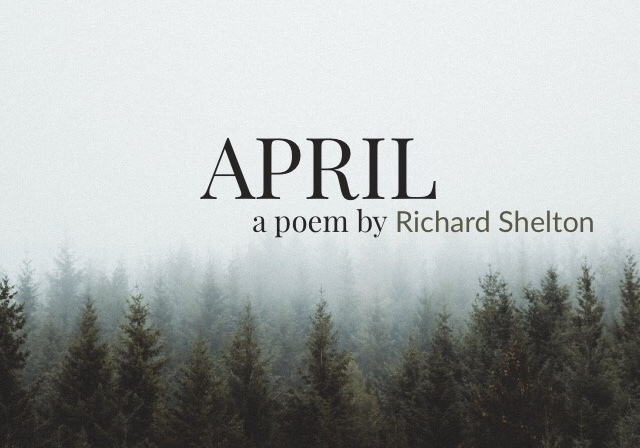 Well, it’s not out in the world yet, but it has been bought by a real honest to goodness publisher and has a publishing date set for March of 2020. Done and done. And while I wait for things to progress on that front, I’ve been working on another story. 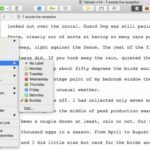 I just finished a draft of that one last week. It’s a mess, but its a story. 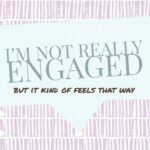 So I’ve just been writing and writing without any real sense of what my goal is. 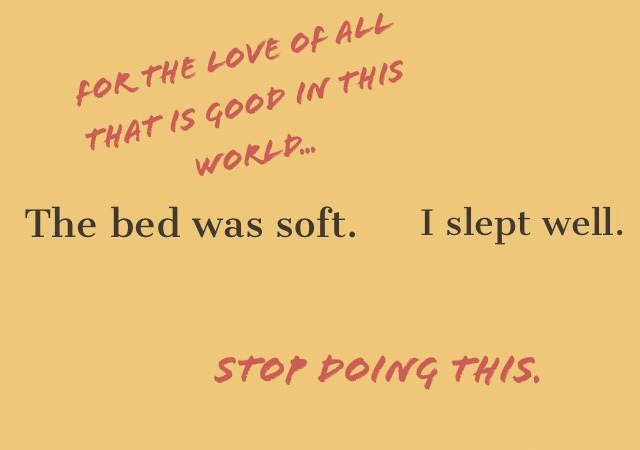 I know I want to make a living with my writing. Good news for me is that I don’t have to make six figures to make this happen. My husband makes a good living, so I really only need to bring in half of our household expenses. That’s a goal. But there are just so many unknowns when it comes to writing and income. A person could write a dozen books in obscurity and then have a breakout hit that makes bank. They might get a book optioned by Hollywood and make some money that way. They might hit it out of the park on their first go, getting a six-figure advance on their debut, and then not be able to sell their next book because they didn’t sell out their advance. So I’m inclined to set other goals, centered around inputs I can control, and hope the money comes sooner rather than later. When I first met with my agent he asked if I thought I could put out a book every year. I’ll admit I flinched. He adjusted: how about a book every two years? Well, this idea is actually really appealing to me. At that rate, the odds of making money go up. 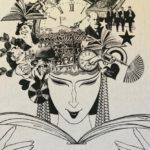 Not only is a writer more likely to get to that one book that is a big hit, but with each book you gather a few more readers who like your books and might be inclined to buy them when they hit the shelves. They might go back and buy your previous books. 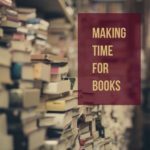 Some writers write four books a year to reap the benefits of accumulated work, but there’s just no way I can do that. 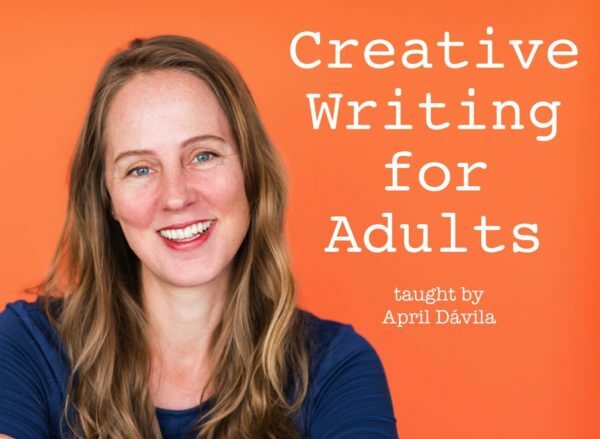 Maybe if I had started writing before I was a mom, before I started spending five hours a day driving these little people to various practices and appointments, not to mention a husband that I actually like spending time with. Oh, and my two blogs. There’s no way. But a book every two years? That I feel like I could plan for. 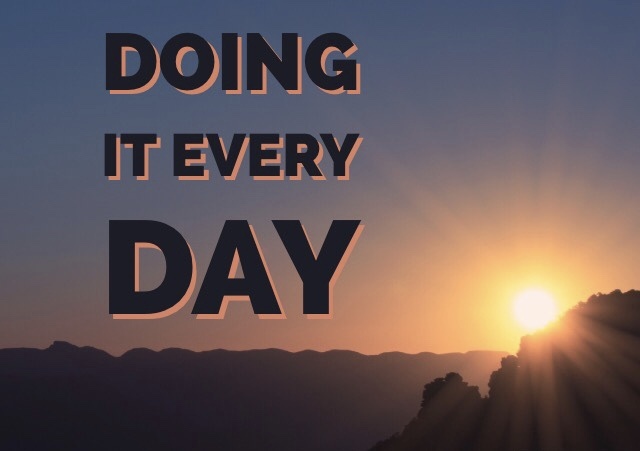 I started thinking about how, as I pushed to wrap up the draft of my second story, I was writing about 2,000 words a day without sacrificing too much in terms of life balance. 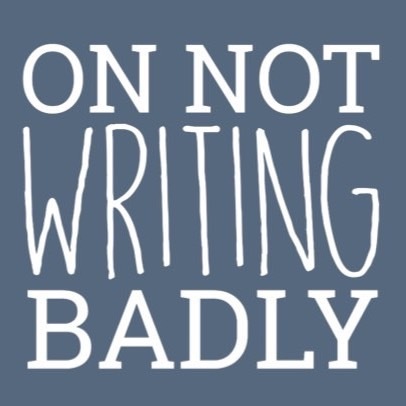 At that rate I could put out a rough (and I do mean rough) draft in three months. But then, I’m supposed to get notes from my editor on my first novel this week. Contractually I have four months to make the edits, but I’m hoping I can do them in three. 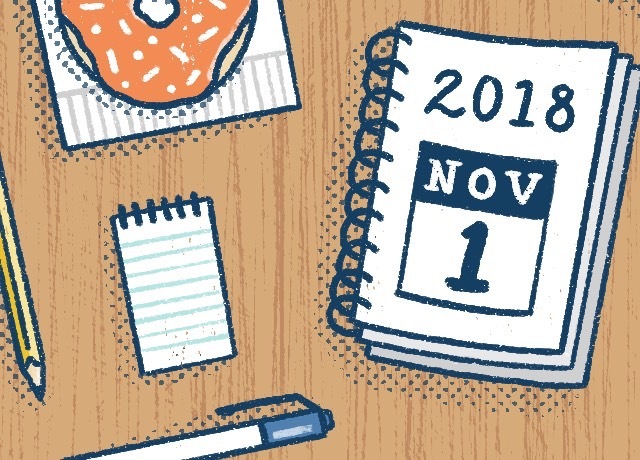 All of this is to say that it’s hard to know how to set goals as a writer. There are so many external variables, so many things we can’t control. 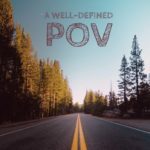 How do you set goals? Do you go with dollar amounts? Do you maybe go for awards or accolades of that sort? Number of copies sold? I’m so new at this, would love to hear your thoughts. 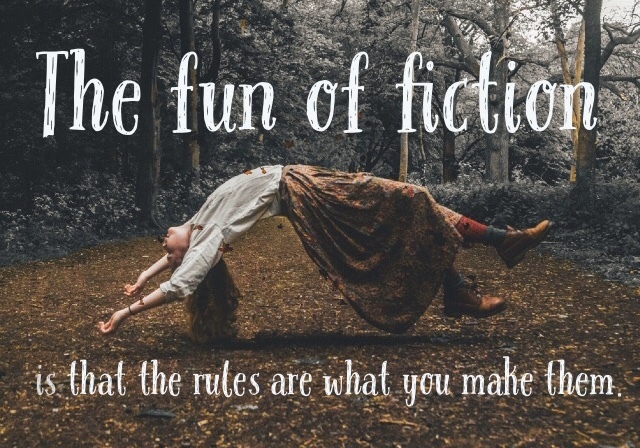 You can see in the top ones some of the elements of my story (including ostriches and a woman with a cowboy hat), but I think my favorites are the ones along the bottom. 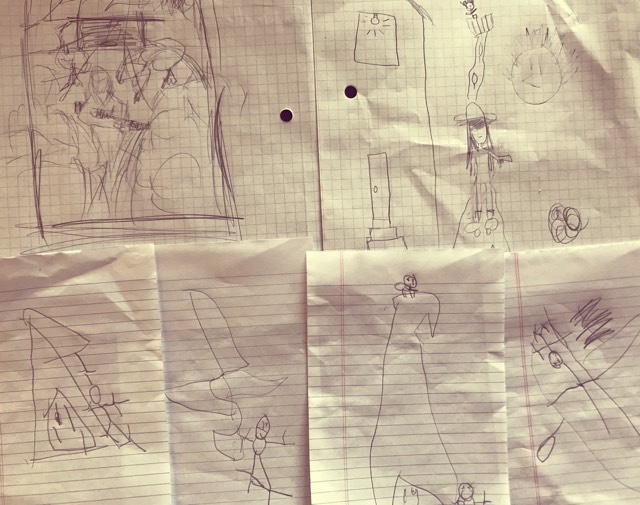 My seven-year-old boy gave me cover ideas along with his thoughts on how to improve the story: it really SHOULD have more underwater drones and ninja stars. Even though I probably won’t forward these to my publisher, I was totally feeling the love. To see this book slowly taking shape is such a great adventure. Now go do some trick-or-treating. I’ll catch you next week. Okay, so technically Dictionary Day was yesterday, but I’m celebrating all the same. 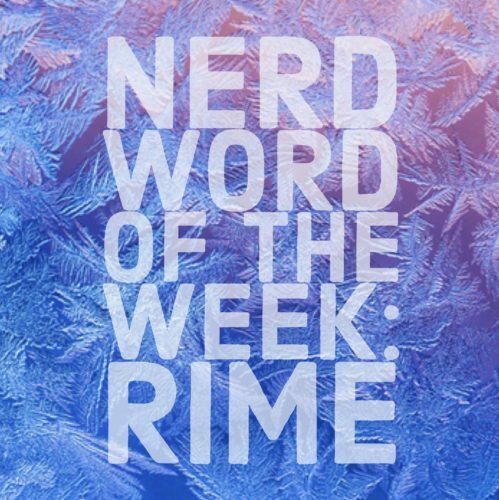 Here are nineteen nerd words for all my word nerds out there. Deipnosophist ~ an adept conversationalist at the dinner table. 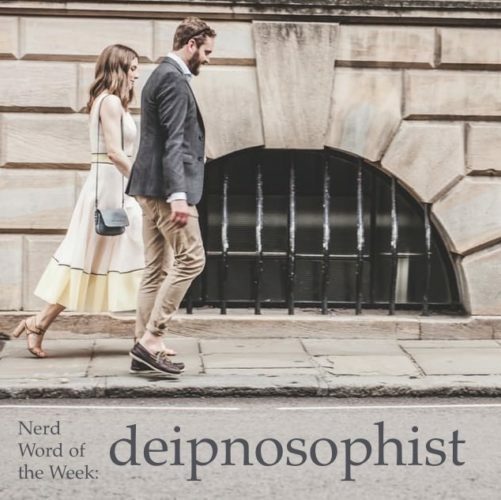 As in: He brought Rachel, the deipnosophist, in the hopes that she would distract his mother. 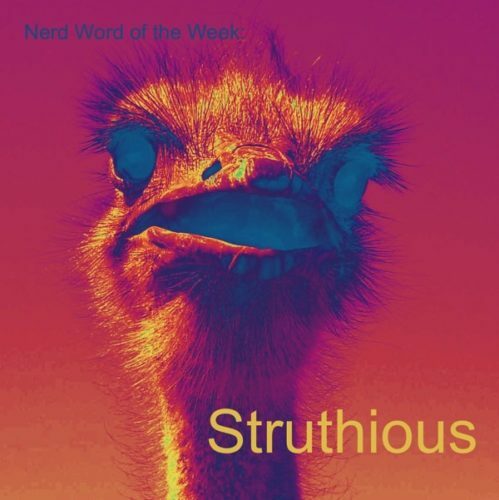 Struthious ~ Of or relating to ostriches. As in: I’m writing about struthious birds in the Mojave. 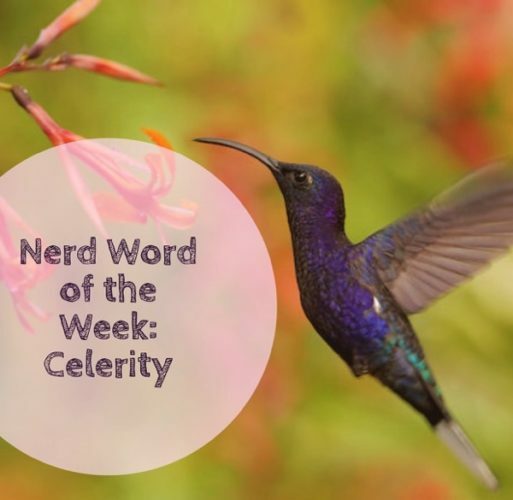 Celerity – swiftness of movement. As in: It moved with the distinct celerity of its kind. 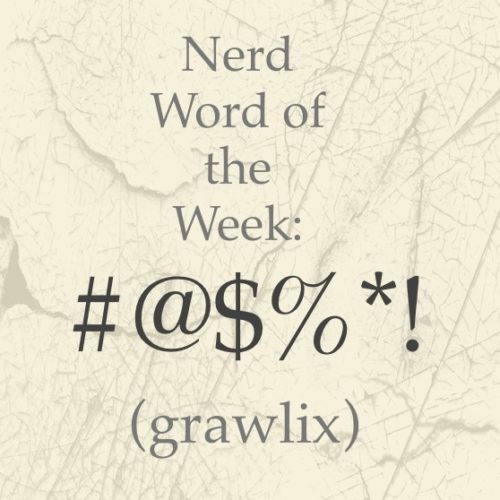 Grawlix ~ A string of typographical symbols used to represent an obscenity. As in: She told him to go #@$%*! himself. Callipygian ~ having well-shaped buttocks. The beach-bound collection of young, bronze, and callipygian individuals was enough to make one feel lightheaded. Insensate ~ lacking physical sensation. 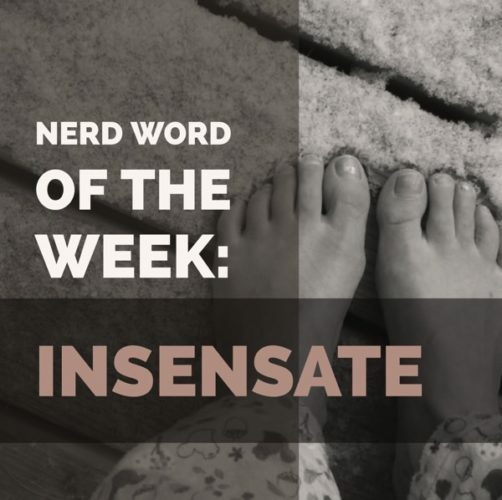 As in: A few moments barefoot left the cuffs of her pajamas stiff and her diminutive toes insensate. 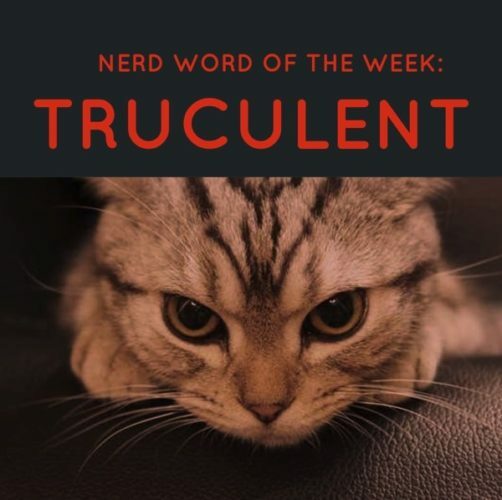 Truculent ~ eager or quick to argue or fight. As in: The truculent little beast would hide in the strangest of places, just waiting to attack. 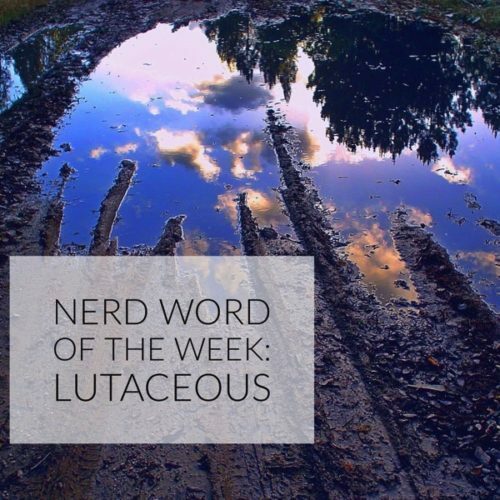 Lutaceous ~ pertaining to or made of mud. As in: The only color in the lutaceous landscape lay in puddles of water that reflected the brilliant blue sky above. 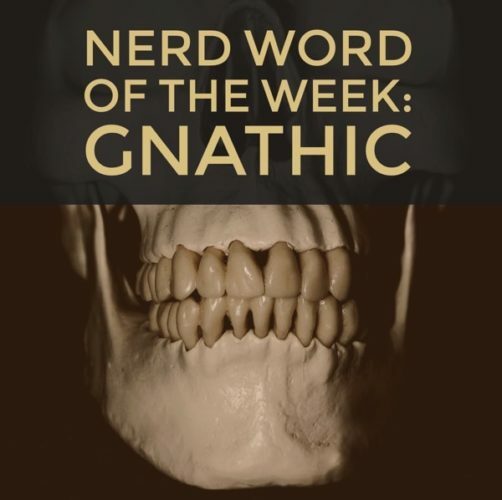 Gnathic ~ having to do with the jaws. As in: Everything we know about that particular branch of the genus “homo” was deduced from a single gnathic fossil. Quomodocunquize ~ To make money in any way possible. 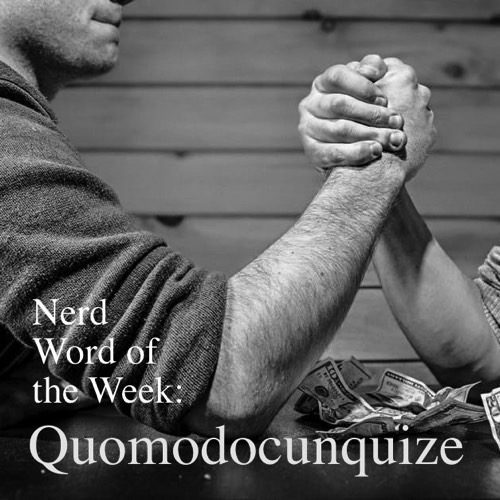 As in: His baby needed food, so he set out to quomodocunquize. 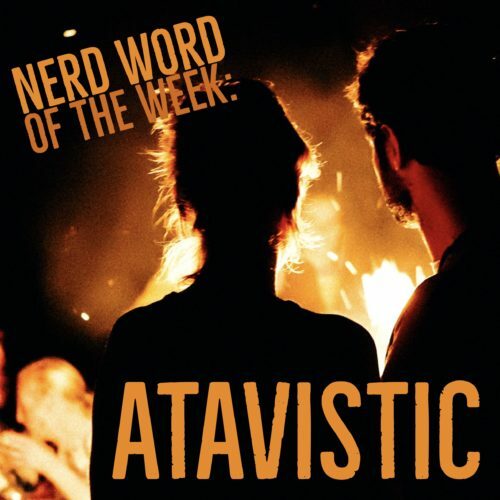 Atavistic ~ relating to or characterized by reversion to something ancient or ancestral. 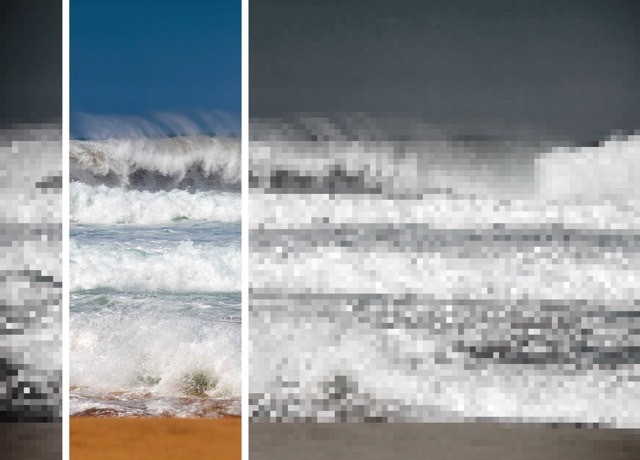 As in: They backed away from the atavistic scene, hoping they might remain unseen. 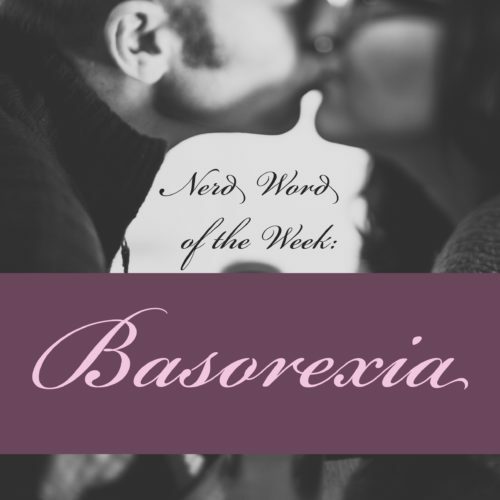 Basorexia ~ an overwhelming urge to kiss. As in: For months they lived in a constant state of basorexia. 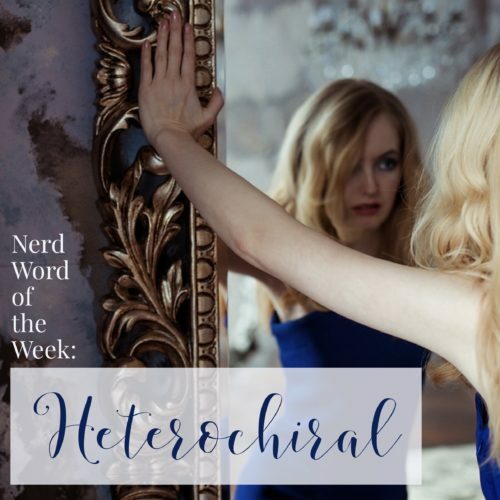 Heterochiral ~ reversed (as a mirror image), but otherwise identical. As in: Her heterochiral self always inspired thoughts of parallel realities. 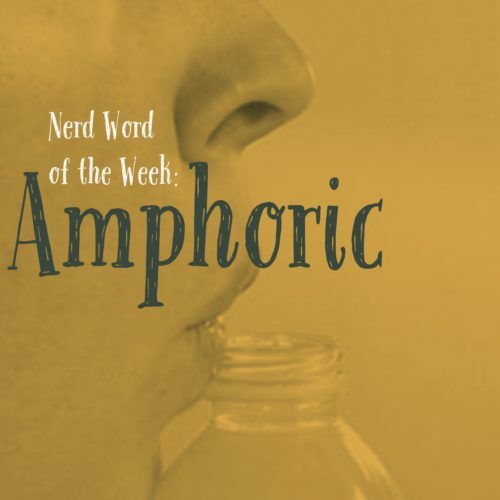 Amphoric ~ characteristic of a sound made by blowing across the mouth of a bottle. As in: She helped him up, taking note of his amphoric breathing. Rime ~ frost formed on cold objects. As in: The rime on the window pane obscured the source of the rosy light. 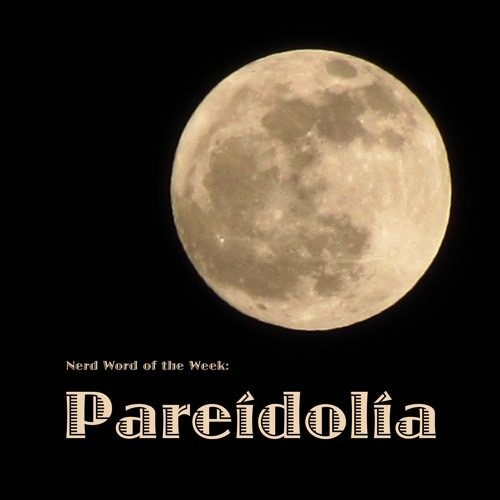 Pareidolia ~ the imagined perception of a pattern or meaning where it does not actually exist. As in: Her shock stemmed from the most human of experiences, a common case of pareidolia. 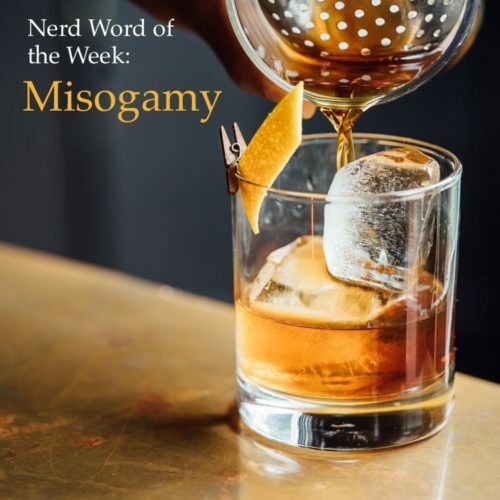 Misogamy ~ the hatred of marriage. As in: The open bar helped to quell his misogamy. 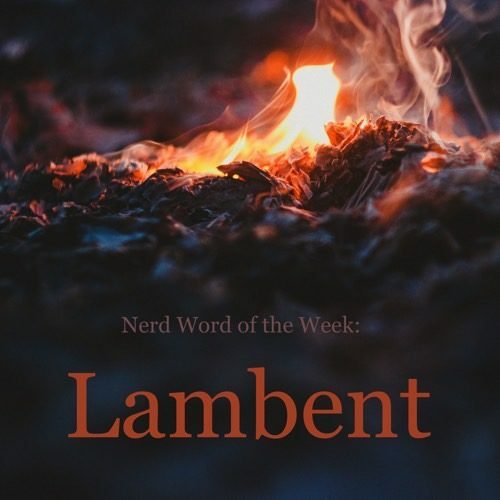 Lambent ~ running or moving lightly over a surface. As in: Lambent flames were all that remained of the night’s inferno. 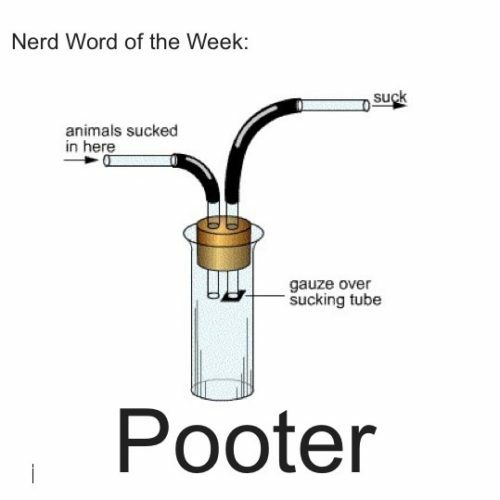 Pooter ~ A suction bottle for collecting insects and other small invertebrates. As in: I caught a wicked-cool beetle in my pooter.